Want to impress your mom on Mother's Day? Don't send her the same tired old flowers. What can you do with a vase full of flowers? After all, they don't connect to the internet or come with a virtual assistant. Instead, pick up a Google Home Mini smart speaker for $10 off. That's right, get your mother the hottest new tech device since the tablet. After all, most of her friends probably have one, and they are quite easy to use. And if one Google Home Mini is a good deal at 20% off (taking the price to $39), buying two for $40 off (a 41% savings) is even better. The pair will cost you $58. And as long as mom is able to say "Hey Google," her smart speaker will be able to do a number of tasks from streaming music, turning on and off smart appliances, ordering a pizza from Domino's, getting a ride from Uber, and more. In fact, when your mom is watching your baby, she can now ask Google Assistant to help her get the infant to sleep by saying "Sing my baby to sleep." A gentle lullaby will play until she says "stop." Another new feature allows her to order ahead at Dunkin' Donuts, so that the order will be ready by the time she heads to the store to pick it up. There are over a million actions that the virtual personal assistant can do. 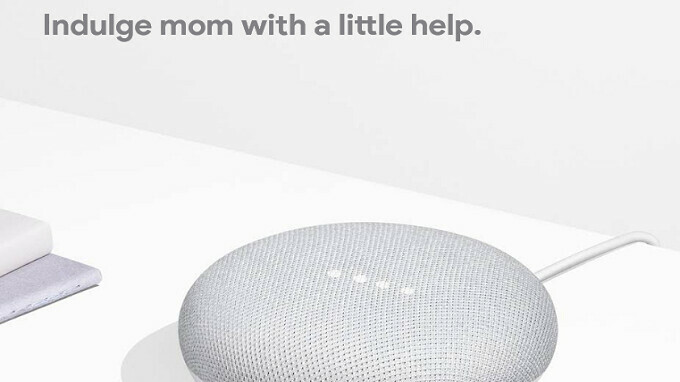 If you want to get your mom up-to-date when it comes to tech, you can take advantage of Google's sale on the Google Home Mini. The smart speaker is available in Chalk, Charcoal and Coral. If interested, click on the sourcelink below. "Hey Google, Can you bring my children to visit me? ", a mom said. Google answer will be like "Sorry, I can't help with that"
she bit her tongue lol.